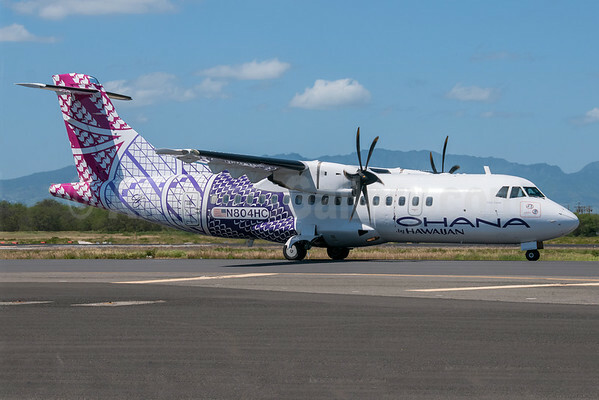 Hawaiian Holdings, Inc., parent of Hawaiian Airlines (Honolulu), today announced plans to acquire three ATR 72 turboprop aircraft in an all-cargo configuration to expand its interisland shipping services. 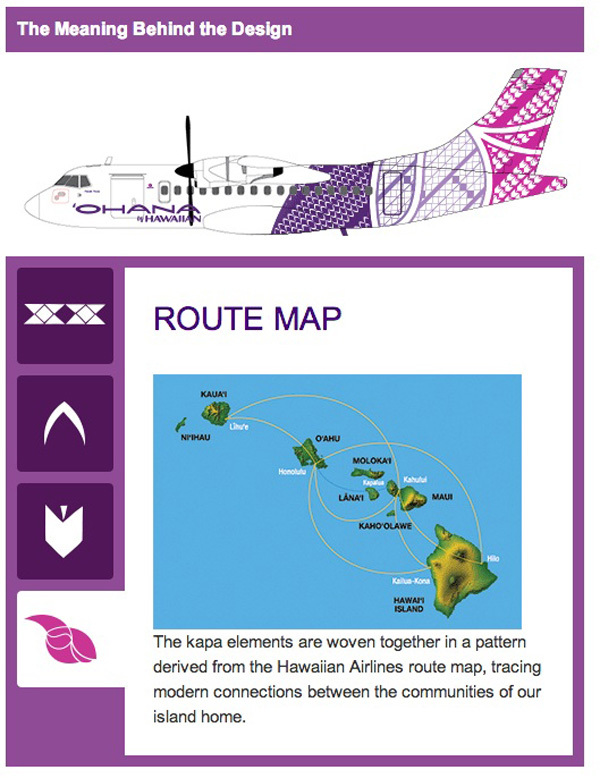 The new operation will launch in the first half of 2016, starting with flights between Honolulu International Airport (HNL) and Kona International Airport (KOA), Kahului Airport (OGG), Līhuʻe Airport (LIH) and Hilo International Airport (ITO), with well-timed connections from Hawaiian Airlines’ mainland and international network. The ATR 72 fleet can carry up to 18,000 pounds of cargo and will be able to handle five 88-by-108-feet aircraft pallets or up to seven LD3 containers, skidded cargo and oversized shipments. Express services for smaller shipments will also be available on its 160 daily B717 flights throughout the day. The flights will be branded ‘Ohana by Hawaiian and operated by Empire Airlines, which also operates the 48-passenger ATR 42 turboprop service (above). The livery of the aircraft will feature the same kapa tail patterns created by Hilo-based artist Sig Zane and his son Kūha’o (below). The new cargo operation will create more than 100 new Hawai’i-based jobs in various areas of air transportation including pilots, mechanics, ground handlers, sales, customer service and management positions. 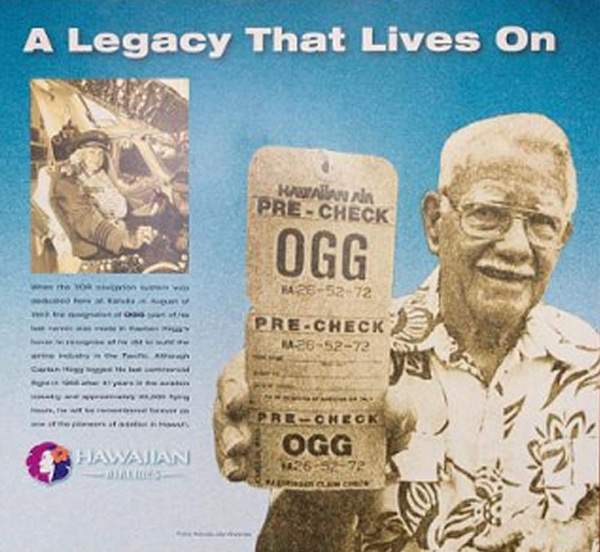 Hawaiian Airlines was the first U.S. airline certified to ship cargo in 1942, and has provided high-quality overseas shipping and customer service to international customers, freight forwarders, carriers and many others in the industry for more than 70 years as the flagship carrier of the Pacific. Top Copyright Photo: Ivan K. Nishimura/AirlinersGallery.com. Operated by Empire Airlines, ‘Ohana by Hawaiian-branded ATR 42-500 N804HC (msn 623) taxies at the Honolulu base. This entry was posted in Empire Airlines (Idaho) (3rd), Hawaiian Airlines, Ohana by Hawaiian and tagged 623, ATR, ATR 42, ATR 42-500, ATR 72, cargo, empire airlines, Hawaiian Airlines, Hawaiian Holdings, Hilo International Airport, HNL, Honolulu, honolulu international airport, Inc., Kahului Airport, kona international airport, N804HC, Ohana by Hawaiian on July 21, 2015 by Bruce Drum. Hawaiian Airlines (Honolulu) flight HA 24 departed Kahului on Maui at 11:18 a.m. yesterday (May 1) bound for Oakland. The flight crew declared an emergency and landed safely at Kahului Airport (OGG) at 11:50 a.m. after the smell of fumes was detected in the cabin according to MauiNow.com. The 224 passengers and 10 crew members safely evacuated the Boeing 767-300. HA Flight 24 left Maui at 11:18 a.m. for Oakland, and returned to the Maui airport soon after departure due to an odor of fumes in the cabin. The flight crew declared an emergency and landed in OGG at 11:50 a.m. All customers were evacuated via emergency slides. There were 224 customers and 10 crew onboard. At this time there are no reports of serious injuries. 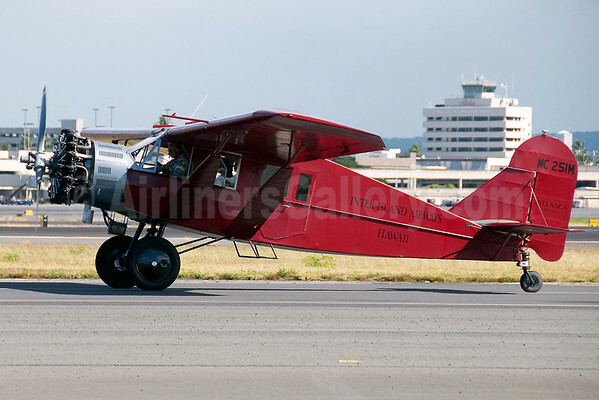 This entry was posted in Hawaiian Airlines and tagged #24, flight HA 24, HA 24, Hawaiian Airlines, Kahului, Kahului Airport, Maui, Maui airport, Oakland on May 2, 2015 by Bruce Drum. 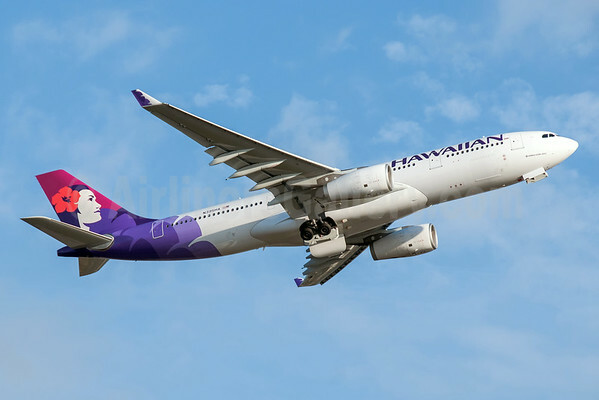 Hawaiian Airlines (Honolulu) has announced it will offer nonstop service between San Francisco International Airport (SFO) and Kahului Airport (OGG) beginning November 20, 2014. 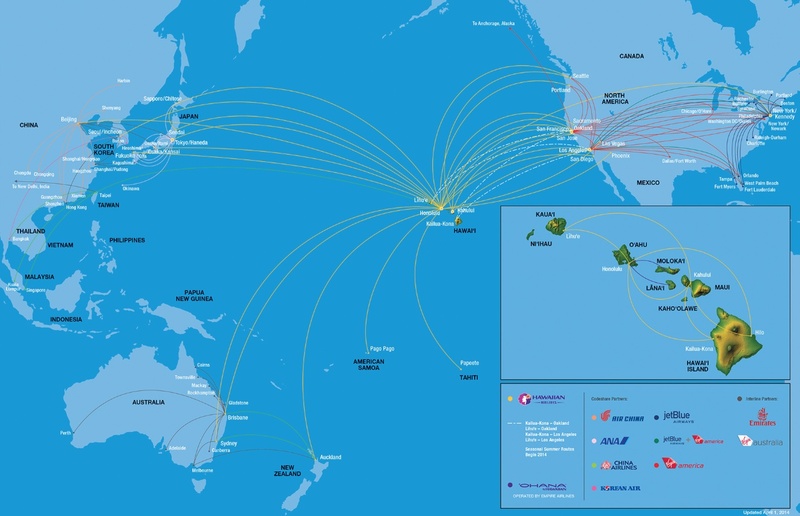 The nonstop service between San Francisco and Maui will begin with flights four times a week from November 20, 2014 before moving into daily service beginning December 17, 2014. The new daily service will add a total of more than 210,000 seats to both San Francisco and Maui travel markets per year, and will be operated by Hawaiian Airlines’ wide-body, twin-aisle Airbus A330-200 aircraft, which seats 294 passengers, with 18 in First Class and 276 in the Main Cabin. Copyright Photo: Ivan K. Nishimura/Blue Wave Group/AirlinersGallery.com. Airbus A330-243 N395HA (msn 1469) departs from the Honolulu base. This entry was posted in Hawaiian Airlines and tagged 1469, A330, A330-200, A330-243, Airbus, Airbus A330, Airbus A330-200, Hawaiian Airlines, HNL, Honolulu, honolulu international airport, Kahului Airport, N395HA, San Francisco, san francisco international airport on August 14, 2014 by Bruce Drum.